Future Rock will return to the 2010 installment of the Summer Camp Music Festival at Three Sisters Park in Chillicothe, IL. This marks the 5th consecutive appearance for Future Rock at this amazing festival, which is celebrating its 10th year... so you know what to expect. 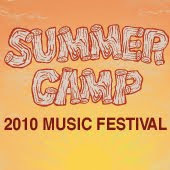 Summer Camp Music Festival takes place over Memorial Day Weekend on May 28-30. Tickets are $150.00 for a 3-day pass and on sale now. Get them here.